Legendary singer and painter Tony Bennett has donated a portrait of the great jazz trumpeter and singer Louis Armstrong to be auctioned in support of the Louis Armstrong House Museum. The oil painting depicts Armstrong performing on his gold-plated Selmer trumpet. This is the second Tony Bennett portrait of Armstrong. The first one was painted in 1970 and presented personally to Armstrong by Bennett. 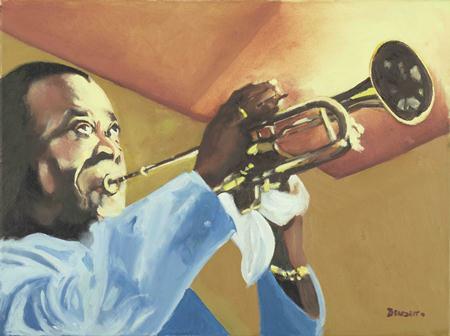 The painting still hangs in the den of Louis Armstrong’s house, which is now the Louis Armstrong House Museum. Visitors to the museum can hear an audio recording of Armstrong speaking about the painting and about his friend “Benedetto”. Benedetto is Tony Bennett’s birth name and he uses it to sign his paintings. The auction opened at Charitybuzz.com on February 1, 2012 and continues through February 29th, 2012. Both Tony Bennett’s original painting of Louis Armstrong and his new painting will be on exhibit together during the month of February at the Louis Armstrong House Museum until the close of the auction, giving museum visitors the opportunity to see both paintings together before the auctioned painting ends up with a private collector. According to the museum, proceeds from the auction will underwrite historic house tours, concerts, and community programs at the Louis Armstrong House Museum. In the video below from DNAinfo.com, museum director Michael Cogswell talks about the museum, the paintings, and the auction. This was written by Lorrie. Posted on Saturday, February 11, 2012, at 4:22 pm. Bookmark the permalink.